The Hong Kong People are so used to and love a big crowd. This picture was taken outside of the Sogo Department Store in Causeway Bay. People in Hong Kong share some unique characters that you can hardly find anywhere else in the world. Some are good and some are bad. Because of these characteristics, it helped create an environment for prosperity. Let's check out these characters one by one. 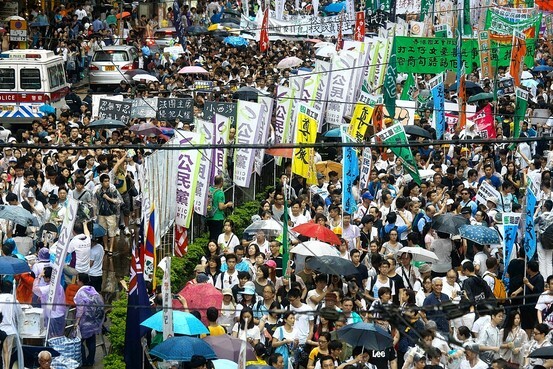 Since the Tienanmen Massacre on Jun 4, 1989, the Hong Kong people love to rally. Anything they don't think is right, they go on a rally. I still remember that year. I was in senior high school. Everybody was angry. We all tied a black banner on our right arms to pay the condolences to the victims. Our school allowed us to put big banners on the school building to support the students in Beijing. My sister and I wanted to be in the rally. But our parents prohibited us from doing so. The day after the Massacre, it was raining horribly. Still over a million people went on a rally. While I am writing this, I still feel the emotion of that time. There was a lot of crying and many prayers for those students and parents who lost their only child in the Massacre. Back to the present, the Hong Kong Government does not suppress these activities as long as the rallying groups/organizations give advance notice to the HK Police Department and it is approved. The latest Umbrella Movement started out with good purpose and peaceful. After a while, some trouble makers, like the members of the triad societies, mixed in and got messy. My aunt (from Mainland China) thinks that there is too much freedom which allows people to do these things. To me, this is FREEDOM. 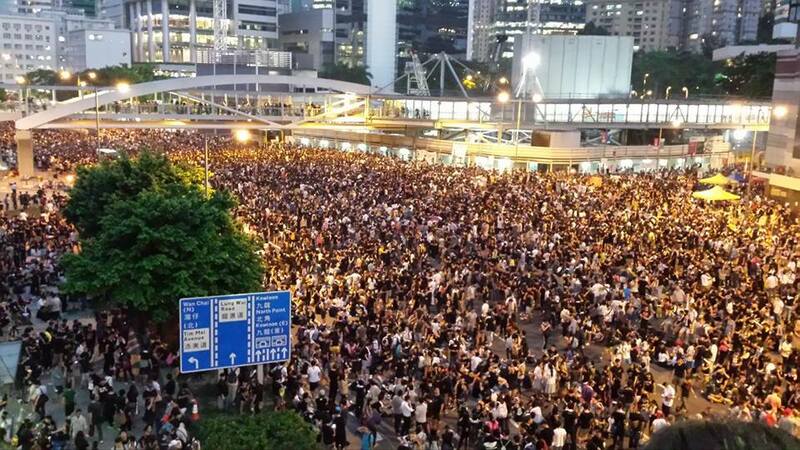 In the eyes of most people around the world, Hong Kong no longer has the freedom we used to have before the Handover. I must admit that it is different from what I felt and experienced in the past. However, compared to anywhere in the world, I'm still very proud to say that we do and enjoy it very much. If you happen to see some roads that are blocked for the rally when you travel in Hong Kong, feel what FREEDOM is about. Some people get overwhelmed with the big crowds in Hong Kong, especially those that have immigrated to other countries and come back to visit. 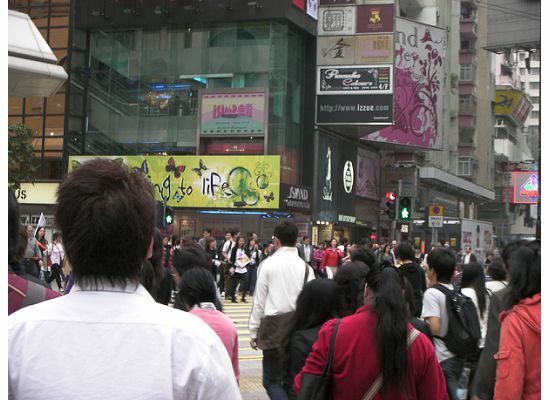 You can see big crowds all the time in Mong Kok and Causeway Bay, particularly in the shopping areas. Before the big festivals, crowds are even bigger in the malls, such as Christmas and the Chinese New Year Flea Market in Victoria Park. Christmas time, Hong Kong people love to appreciate the Christmas lights. And these lights make the Hong Kong skyline even more breathtaking. 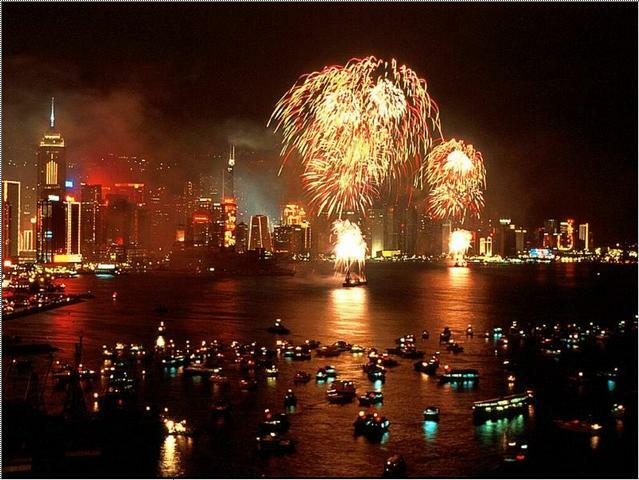 Every 2nd night of the Chinese New Year (Hong Kong holidays schedule), there are fireworks in Hong Kong's Victoria Harbour. It lasts for 30 minutes. But it is on a really BIG scale. Hundreds of thousands of people love to gather along the harbour front to appreciate it. Some people will rent a boat or a junk boat and appreciate the show right from the harbour. I personally went to see firework with my parents when I was a kid. We were standing on top of the bridge in Wanchai because my grandparents' apartment building was right there. It was so convenient for us to finish dinner and went. It was phenomenal. I swear I have never seen one as great as this since then. There were several occasions that I went with my parents go check out the Christmas and Chinese New Year lighting. It was very crowded. But it was ok. I guess I grew up there and used to it. But my last time being in the big Hong Kong crowd was the Lan Kwai Fong tragedy in 1993. My parents and my youngest sisters were out of country traveling. One of my younger sisters and I decided to celebrate New Year by meeting some friends in Lan Kwai Fong. The crowd was out of control. Before the stampede, our feet were up in the air. We were sandwiched in between. I still can hear my yelling over to my sister and friend, "Hold on to your purse and each other. DON'T. FALL." Then, everything stopped. The sirens were blaring. We were very lucky. None of us were hurt that night. My parents asked us if we went as soon as they got back to Hong Kong. Since then, I stopped going to anywhere else with big crowd. There is a saying to describe the Hong Kong people, "The excitement only lasts for 3 minutes." We love everything new, such as new food, new stores, new trends, new cars, new phones and so forth. They also like to think and/or create new stuffs and new ideas. Most of these new ideas apply to businesses. Hong Kong people are very open-minded. They like to try everything that's new. 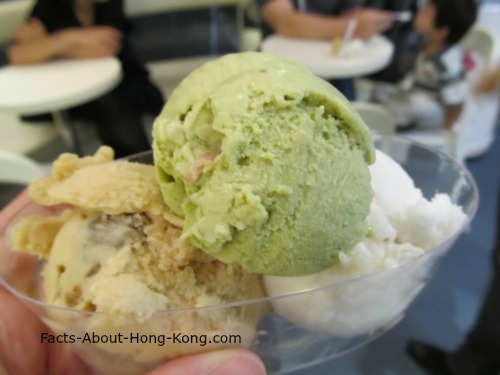 I remember one year (maybe 2005) going back and they had the Japanese style ice-cream. You would never think to have these kinds of flavors, such as curry, tofu and white rice etc. I tried it. It was wild, but tasted really good. 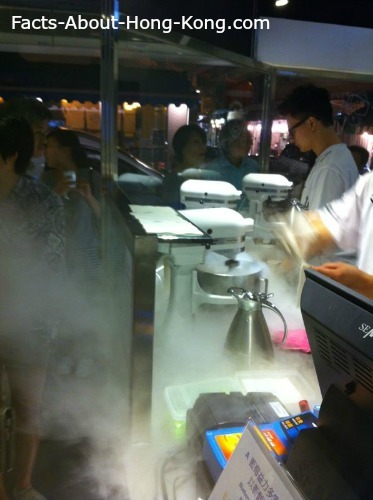 People lined up for hours just to buy one cone. A few months later, they got tired of it. So, the chain stores closed. It didn't mean that businesses cannot last forever. But it just depends on what kind of business it is. You will always find the most high-tech stuffs in Hong Kong, for instance, cell phones. An average Hong Kong person changes to a new cell phone in every 6 month. Yep...cell phones are like fashion in Hong Kong. Hong Kong people always talk about efficiency. Step into any McDonald's in Hong Kong, there are 30-50 people lining up in front of the counters most of the time. But I can guarantee you that you can get a hot, fresh meal within 10-15 minutes. During the peak hours, there is one MTR every minute. But Hong Kong people do not have patience to wait that extra minute. It is very common to see people running towards a train which is already packed and the doors are ready to close. They still squeeze right in. This trait is even running through the services, products and merchandizes Hong Kong people use, such as over-the-counter medication, electronics and more. If they are not as good as what they claim, they will disappear from the market like a snap. And I mean it. Before I became a teenager, I recall that Hong Kong people fell in love with buffet style eating all of a sudden. It has not changed since then. 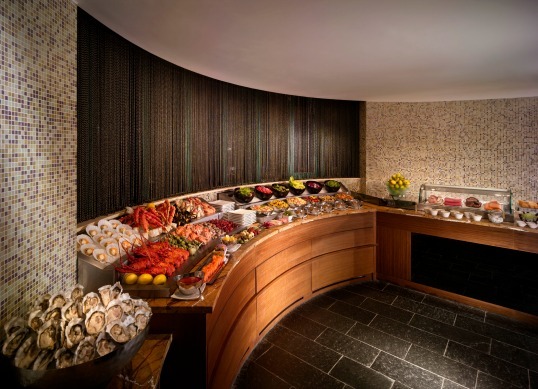 Unlike most buffets in any other countries, buffets in Hong Kong are expensive and always serve as high-end meal. Most important of all,the quality is superb in most restaurants. Every year, there is at least one TV program for fund raising for local charitable organizations or victims of a natural disaster. All the TV and movie stars will work together for 8-10 hour marathons. They usually raise around HKD100 million (approximately US$12.8 million) every year. During the weekends, you may see people in the streets carrying a bag and several sheets of stickers. They may approach you for a donation. As soon as you put the money into the bag (Don't worry, once the money is in, it can't come out until it is returned to the charitable organization), they will put a sticker on your shirt. So, when another person sees you and wants to approach you again, they will not bother you again. A "sticker" I got from a donation to an organization. The actual size of the label is about 1" x 1". Sometimes, it maybe a circle. The size is about the same. These charitable organizations get the permission to do so from the police department. No individuals are allowed to do so by carrying that kind of bag and ask for donations. The people that approach you for donations could be seniors or students. This kind of charitable activity started since my mom was in high school. Schools always ask for the volunteers. Everybody is always excited to participate. As for my mom, all my sisters and I have volunteered at least once during our high school era. As you walk in the streets, you realize that there are hawkers, convenient stores, fast food shops and so forth. They are always packed with people. 'Cos Hong Kong people can't stop eating. One of my younger sisters falls into this category. When you shop with her, you are constantly eating. But she is not fat at all. Why? There is a lot of walking in Hong Kong, you will walk it off quickly. So, take advantage of doing this when you travel in Hong Kong. You can try all the Hong Kong style food . Plus, they are very reasonable in price. I'm sure you will enjoy it. The importance of health in the last couple decades encourage Hong Kong people to seek for the activities close to the Mother Nature. Two major ones are hiking and local farming. 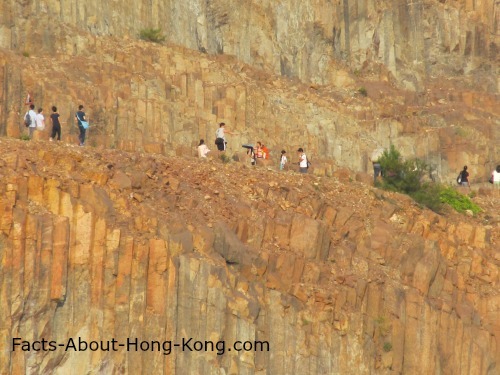 There are books and articles written targeted on Hong Kong people looking for hiking trails. When we went to Hong Kong GeoNational Park (coming soon - link to Hong Kong GeoNational Park page), you would not believe how big and enthusiastic the crowd was. Families with small children brought along their hiking equipment to conquer the task set in front of them by Mother Nature. Some people choose to eat healthy by growing their own vegetables on the roof top of their apartment buildings. Some just want to enjoy the fun to be close to the nature. They would rent a very little piece of land, no more than 100 sq. ft., either in the rural area Hong Kong or Mainland China to grow their own food and/or plant. Oh, yeah...there are always some intelligent people find good opportunities to found a business for this group of Hong Kong people. That's why this city is prosperous. Courtesy to my long time supporter and fan, Zainam. Hong Kong people are superstitious one way or the other. 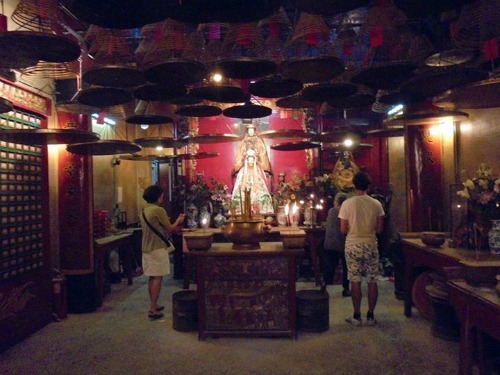 Even people in my generation look and act very westernized, we sometimes act with our superstitious beliefs. a) A cyst/pimple on your nose means you are going to spend some money that you don't want to spend, but you have to, like plumbing problem in the house or things similar to this. b) Everything does not work out the way it is supposed to be lately. Got to get rid of the bad luck. Throw away a Hong Kong dollar coin somewhere on the street and say goodbye to the bad luck. But....don't pick up any coin in the street. That means you are picking up somebody's bad luck. c) When you buy present to someone for any occasion, stay away from buying mirror, shoes, candle or clock. Mirror means you indirectly telling someone else that he/she is ugly. Shoes mean bad luck. Candle and clock mean you are cursing someone to be dead. I know...they sound silly and very irrational. But that is Hong Kong culture. Share with us some superstitious craziness from your country by scrolling to the bottom of this page and comment. There is a Hong Kong saying, "Rice smells nicer next door." I guess this is a very common trait of people in the universe. Hong Kong people is no exception. They always think that education overseas is better. Many things in the western countries are better than in Hong Kong. Therefore, many families send their children to study aboard, such as UK, United States, Australia and so forth. Little do they know that if they only go to county colleges or state universities, they may as well flush their money away. It is also one of the reasons why "International Schools" in Hong Kong believed to be better than any Hong Kong schools, too. Ironically, any graduates coming back to Hong Kong are raised to the top of the pedestal. They have more job opportunities with better potential pay and career future. Working class in Hong Kong always ask for better benefits, such as medical insurance and pension plan. Many of their representatives keep telling the Hong Kong government that we need to copy certain countries to do this and that. But they never drilled into the details of how much money you need to pay out of your pocket. To be honest with you, had I never lived in the United States and Canada, I would never realize that Hong Kong has one of the best, the most advanced and the most affordable healthcare system to keep all their citizens safe and healthy. 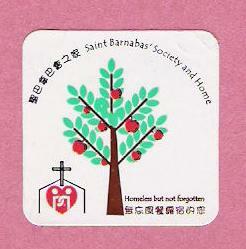 Because of the same belief, Hong Kong started "Mutual Pension Fund" (a.k.a. MPF) in 2000s which has the same logic and mechanism behind 401K in the United States.